Captial Pursuit....Redemption? I think so! There's a fine line between being proud and being boastful, bear with me if I sound like the latter (not my intention). 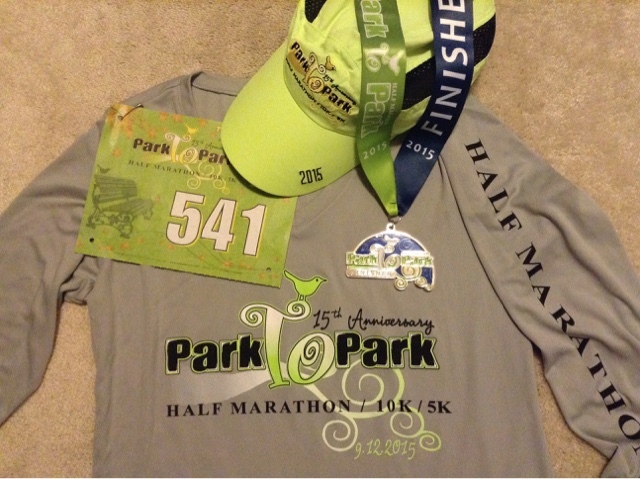 Coming off of a great race a week ago (the Park to Park Half Marathon), I had mixed feelings about my performance. It was, indeed, my best race in almost a year (consistent pace with minimal aches or pains), but I still came up short of my desired finish time. Although I was very happy with how the race went for me, I still had that elusive PR taunting me. I really wanted (needed?) redemption. 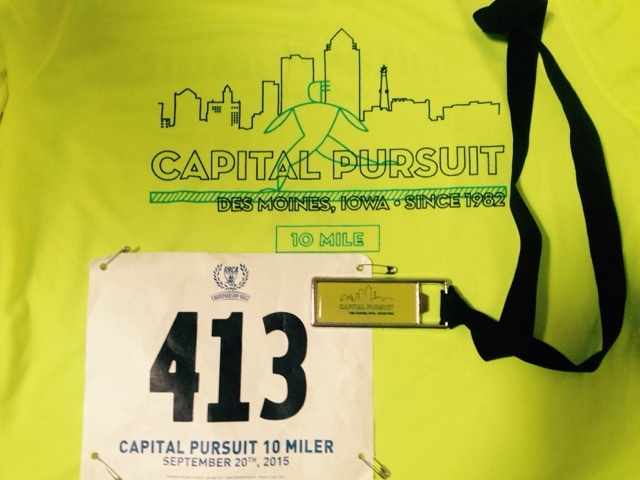 The Capital Pursuit (10-mile race in Des Moines, IA) was one more opportunity to tempt fate. As luck would have it, we had perfect race day weather conditions....mid-50's temps at the start line, lots of sunshine, and minimal wind. To further test my luck, I committed a couple "never-do-anything-different-on-race-day" sins. I have been dealing with Plantar Fasciitis off and on since June. It isn't much of a problem anymore, but it does beckon my attention every once in awhile. As a precaution, I have run almost every race (and long training run) in the past few months with a PF compression sleeve over my arch/heel. It is rather ugly, but it keeps everything nice and tight. 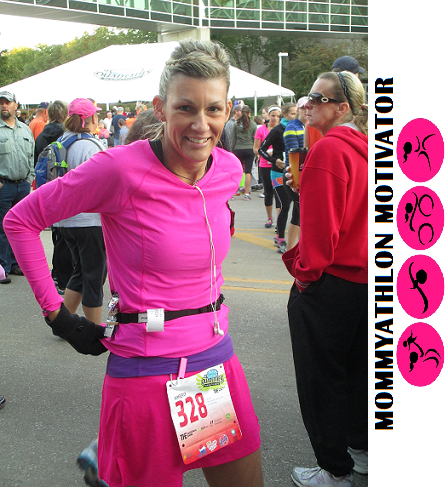 I decided to tape my arch instead of donning the less-than-attractive sleeve for this race. 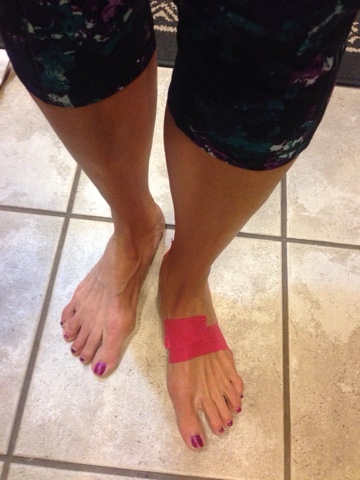 I have taped it for recovery, but never actually for running...so this was a bit of a gamble. I knew if it felt bothersome, I could easily pull over and remove the tape (but I would lose a few minutes of valuable race time in doing so). Another altered race day strategy was my fuel. I have been using PlowOn gum (as an energy source) recently and have had great luck with it, but still have been at a crossroads with fuel. The gels, sport beans, shot blocks, etc. all make my tummy feel icky....not just during the race, but for several hours afterwards. Several runner friends use Tailwind, so I decided this was the day to try it for myself. Unlike the other forms of fuel mentioned, Tailwind is a powder that is mixed with water.....thus, it requires a hand-held (bottle) system other than a shove-in-your-pocket method. I have used water bottles for training runs, but never on a race course. My friend, Barb, and I arrived at the race scene, got our packets and met up with Chuck, another friend who was running with us.We lined up, listened to a beautiful rendition of the National Anthem, and we were off. I don't know if it was my focus on a PR, the beautiful weather, or the new fuel I was using.....but I bolted across the start line, feeling great. 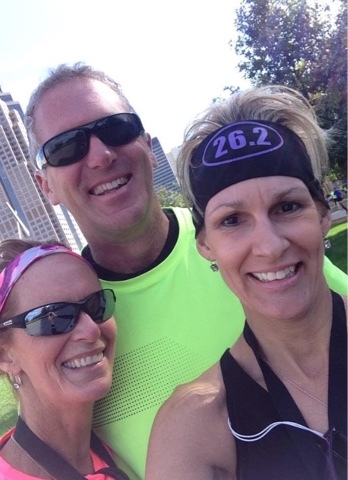 I had no intention of leaving Barb and Chuck in my dust (seriously, I'm not one of those kinds of runners). I didn't realize how fast I was going and assumed they would not be far behind me. I looked over my shoulder a couple times in the first few miles, but didn't see them (I later learned Chuck needed a quick restroom stop). Shortly after the first mile, I could already feel the usual stiffness (piriformis, hammies, glutes) dissipating. That was a very good sign! The first couple miles of the race are flat, but around the 2.5 mile mark, we begin to climb a gradual hill. This hill is not steep or challenging by any means, but it is long and curved (so you can't quite see where it ends until you're almost to the top). Although the hill seemed to take forever, my energy felt great. Having not used Tailwind before, I wasn't sure when I should be drinking it. A couple sips every mile? A big gulp at the water stations? Down the (10-oz) bottle at the halfway point (when I would typically do a gel)? I decided to do a few swallows every couple miles because I didn't want to drink too much of it too soon then be needing a potty stop. Also, I was using a 20-oz water bottle that I had filled half-full (with half of a packet of the powder), and this bottle had a twist-off cap (not a pop-top), so that made drinking it a challenge. I decided to wait until the fourth mile or so (after the hill was done), so I could walk for a few seconds while I drank. Miles 4,5,6 are near the Drake University campus. That part of the route has a few moderate inclines, a couple of turns, and then a long straight-away through a residential area. It's right before the 7th mile that we turn and head south...and have a nice long, downhill to enjoy. I paused for a quick drink, tossed the empty bottle in a trash can, and continued down the hill. Losing the water bottle felt so liberating! A little before the 8-mile mark, the route turns and heads back towards the start line...giving us another long, straight-away for almost two miles. I grabbed a cup of water from the aid station and poured it over my hands...although I had ditched the empty bottle, my hands still felt sticky (annoying!). Home stretch! I still had my gum but got rid of it near the 9-mile mark. The final mile felt great....I had kept a 9-minute pace for the entire race, and was optimistic the PR was in the bag. I had run this race in 1:31:17 a year ago, but was really hoping to finish under 1:30. I ignored my watch, and just gave it all I had. I was still feeling great and nothing hurt! All done! 10 miles have never felt so good! I made it across the finish line in 1:30:27 (official time)....so I got my PR, but missed the sub 1:30 by 28 seconds. But the PR was all that mattered at that moment in time. I quickly remembered there was a time when it was a big victory for me to hold a 9-minute pace for a 5K, and now I was able to do it for 10 miles. Those extra 28 seconds didn't seem so bad after all. It wasn't much longer and Barb and Chuck came rolling in (turns out they had a couple more pit stops along the way LOL). All of us felt great and we were happy with how the race had gone for us. In looking through my mile splits, I got a better (statistical) idea of how I ran that morning (yes! I actually used my GPS watch and was able to get a satellite signal!). I don't necessarily agree with what the stats show because a couple of the splits show a much slower pace than what I felt like I was running, but who am I to pick a fight with modern technology? Although I appreciate having this mile-by-mile information, the math geek in me is having an aneurysm. Most runners who use a GPS watch or device love that kind of stuff, but I'm kind of a different breed. Too much information to (over) analyze. But, I do recognize technology is what is among us and it's best to not fight it....and I am slowly adapting to it. 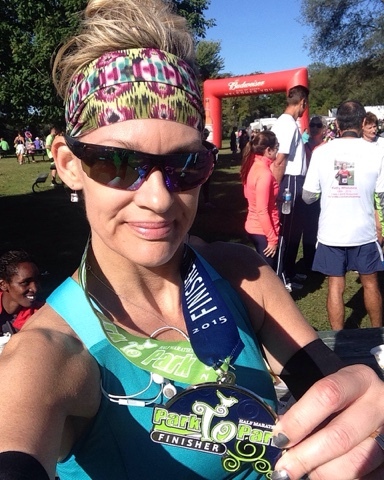 Some final thoughts.....This was another great race for me, and easily my best race of 2015 (I know I said that about my half marathon a week ago, but this turned out even better). The Capital Pursuit is a very well organized event, but I was surprised there wasn't more crowd support. There are numerous volunteers at the aid stations, though, and ample officers manning the intersections.We could not have asked for better weather! After running several races in rain (Grandma's Marathon, Grimes Farm Trail Run, Christmas in July Ultra), it's SO nice to have perfect race day conditions! My gamble with the tape and the Tailwind paid off. Not every race day "chance" pans out so well. I'll be doing both again. So, onward! 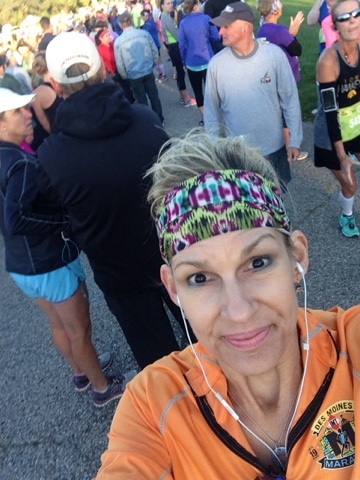 I am hoping for a triple crown of sorts...I have the Quad Cities Marathon happening in a few days (I'm running on a relay team), and am excited to have another fantastic day in my running shoes. Have you ever been blessed with two great races back-to-back? 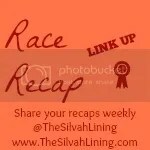 href="http://www.thesilvahlining.wordpress.com" title="The Silvah Lining"><img src="http://i1017.photobucket.com/albums/af296/jsilva814/race%20recap_zpsky3snowg.jpg" alt="The Silvah Lining"
I'm still smiling from my race on Saturday. Coming off of a busy summer, I have been very selective which events I'm putting on my calendar. I'm feeling great due to my easy (running) schedule, and do not wish to go crazy with lots of mileage and revert back to an injured state. It's been almost two months since my ultra, so this race was at the perfect time to ease back into the fall racing season. This was Park to Park's 15th year in existence. I have done the half marathon (all five years that I have attended), but there's also a 5K and this year they brought back the 10K. These races all take place in George Wyth State Park in Watrerloo, Iowa. Most of the course is on trails through the park, some of which are cement, but most are asphalt. 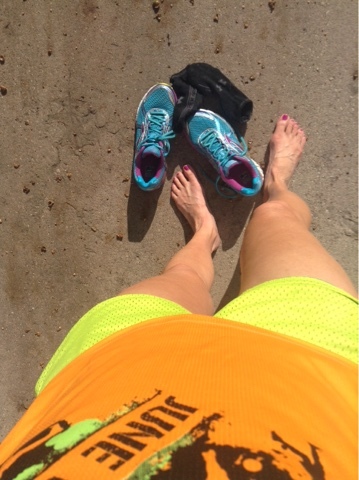 For the most part, the trails are pretty flat and shaded from the sun.....a runner's dream! We also were blessed with perfect race day weather...mid 40's at the start, and high-60's at the finish line. I went into this race in hopes of PR'ing, not just a PR for this particular race course but a PR to outshine all of my previous 24 attempts at going the distance. A little grandiose with my goals, huh! I have been feeling pretty good lately (minimal aches and pains with the piriformis/hammies/glutes), and my speed has finally been showing signs of rising from the drones of a rather lengthy plateau. If a PR was to happen, this would be the course with the best odds of making it happen. 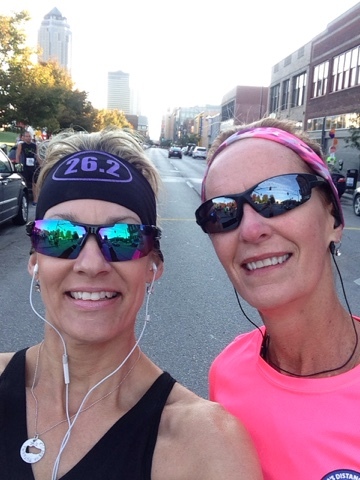 As with most of my races, my dear runner friend, Barb, was along on the journey with me (and also running the half marathon). 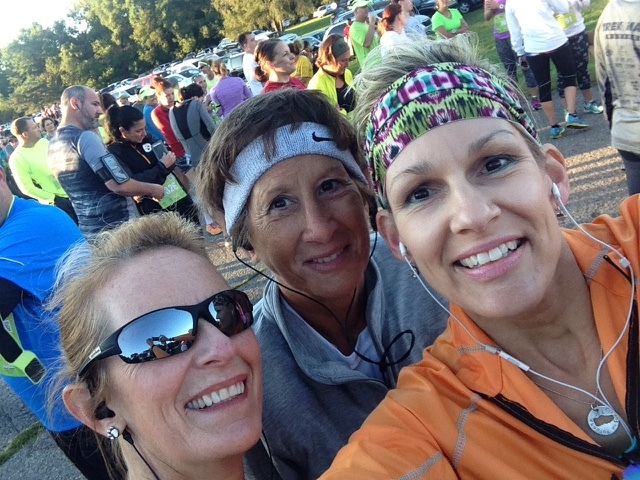 Also, making her first appearance at Park to Park, another great friend, Linda, joined us (she decided on the 10K). A new strategy I have been working on is chewing gum as I run...and I kind of stumbled upon it as I was experimenting with different kinds of fuel. The gels no longer work for me, they wreak major havoc on my tummy during (and especially after) a race, so I have been using PlowOn gum instead as my energy source. Normally, I detest gum-chewing, but this stuff has been working great for me in my running shoes. By chewing as I run, it forces me to take more controlled breathes of air, which helps me manage my pace a little better. And, the gum provides a great energy boost without all the nasty GI side-effects that the gels leave me with. The race began, and we were off! The first mile of any race is usually a "grin and bear it" experience. The muscles aren't quite ready, the air is cold, and my mind is racing (no pun intended) with thoughts of how I'll finish. Not this time. The usual aches, pains, and stiffness were pretty much non-existent. I checked my watch at the 1-mile mark and saw that I ran it in 8:14. Yikes. That's way too fast for me, especially for the first mile. Granted, the first mile has a nice, gradual downhill grade....but even with gravity assisting me, I needed to try to go a little slower. Now, I'm not a super fast runner. An 8:14 pace is pretty fast for me, and I usually do not run at that kind of a clip. I'm more of an 8:45-9:30-ish kind of runner (depending on race day conditions, distance, etc.). I am tall (5'9) and have long legs, so I am constantly struggling with making my strides shorter (which would, theoretically, help with some of my usual issues). Also, I usually run based on how I feel. I have a watch, but I use it mainly to gauge my pace at mile marks because it doesn't give me information on my "current" pace as I'm running. That being said, I was feeling good on Saturday morning and my body just wanted to go. I was able to ease up my pace in the next few miles, though. Each mile showed that I was staying under a 9-minute pace but no longer running quite as fast as that first mile. All was good and I felt great. The Park to Park course starts in a park, then around the fifth mile, we head out towards an open area. We briefly run along a highway, climb a short (though fairly steep) hill in a residential area, and run a couple of miles on a curving cement trail back towards more trails in the park. These 3 miles are my least favorite part of the race because we're out in the open...and we can see the long cement trail ahead of us. 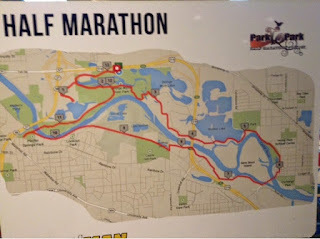 As mentioned, I have run this course four other times, so I knew what to expect on the route. 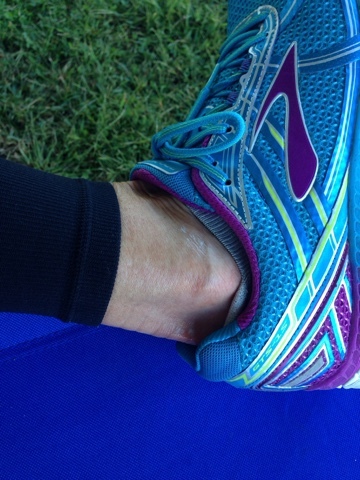 It was somewhere near the 5-mile mark that I noticed a sharp pain near my right ankle. It almost felt like I had twisted or rolled my ankle, because it was so sudden. I looked down and saw a wasp. Seriously? Where did he (or she?) come from? And why was he (or she) so angry with me? I reached down and tried to flick him (or her) away....it took a couple attempts, but I was able to get the little angry bugger to release. OUCH! SIDEBAR--I have a long list of allergies. Several years ago, I was allergy tested and of the 32 allergens I was pricked with, 28 of them flared up on my skin. I quickly tried to remember if bee stings were on the list, but honestly had no recollection. Most of the allergens were "environmental" (trees, grass, pollen, dust, etc. ), but I couldn't remember if bees/wasps were part of the testing. I wasn't concerned about the pain, but I really didn't want to have to worry about a reaction to the sting. Ugh. I forged on. My ankle continued to sting and burn. I couldn't tell if it was swelling or not since it was the underside of the bone where I had been stung. Anyways, onward! I made it back to the park trail, and my pace was still keeping steady. I had eaten a Honey Stinger waffle right before the start of the race, and didn't feel like I needed anything else (other than the gum), so I waited until around the eighth mile to fish a second waffle out of my belt. I had slit the package open prior to stashing it (so I wouldn't have to fumble with my sweaty hands), and had broken the waffle into smaller pieces. I will need to work on perfecting my waffle strategy, though......it was wasn't necessarily difficult to eat as I ran, but it was very dry, so it required a lot more chewing than I would have preferred. I ate about half of the waffle and called it quits. I was able to hold the gum with my (sweaty) finger against the Honey Stinger wrapper, so that was easy to pop back into my mouth after I was certain the last of the waffle remnants were gone. 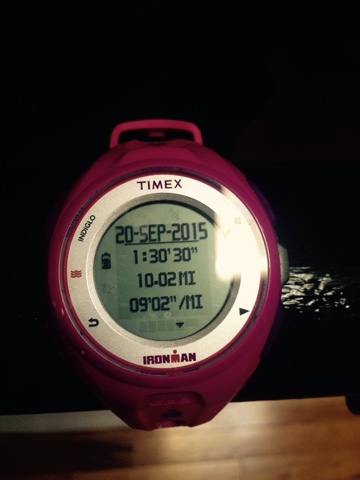 I kept checking my watch at the mile markers, and was staying right around a 9-minute pace. If all continued to go well, I was on track to finally get my Park to Park sub-2, which would also be a course PR! I did notice a bit of fatigue (in my legs) around the ninth mile, but nothing major. I never had any fleeting thoughts of walking (other than through the water stations), and my energy level was still going strong. There is a short out & back turn-around right before the mile-10 mark. For some reason, that little segment is always a bit of a challenge for me...probably because there's a hill right before it (a short hill, but it's also a steep hill), and then a gradual incline after the turn-around that takes us over a bridge. The fatigue is pretty short-lived, though, because I know there's only a 5K in distance remaining. I don't quite know when it happened, but somewhere, somehow, my pace had gradually showed down. When I glanced at my watch at the 10-mile mark, it showed I had been running for 1:35 (and some change). I did the math quickly in my head....I could maybe still swing a sub-2 hour finish, but it would be a close call with no time to spare. I was in a bit of disbelief for a few minutes...trying to figure out where those extra five minutes had come from. Then, I had that sick feeling that I might not make my PR. A few seconds later, I reminded myself that a PR really wasn't that big of a deal. And a few seconds after that, I remembered how much I actually did want that PR. 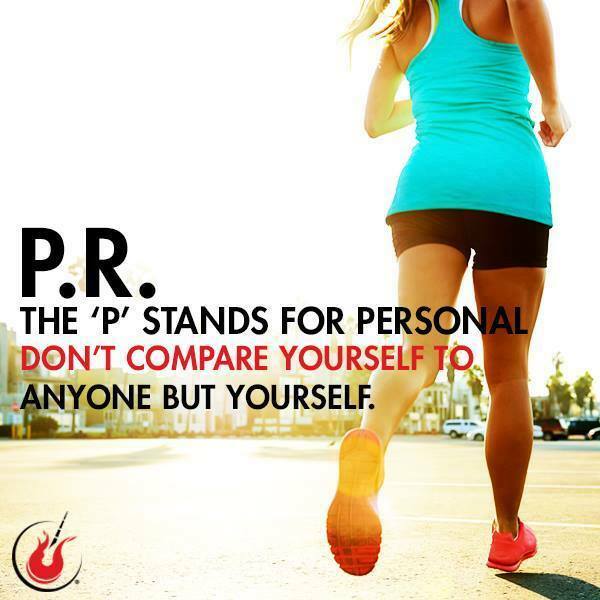 I have mentioned several times how I don't see myself as a competitive runner. I don't have that "dig deep and press on" drive that most runners seem to draw on in moments of crisis or desperation. I can grit it out, and I can persevere, but I have yet to find that "all-out, in-it-to-win-it" mojo on reserve within me (Gee, I'm sounding a bit melodramatic). It would be disappointing to be this close and not get that PR, and I would be even more disappointed if I didn't try for it. I took a quick, deep breath and shook out my hands (a little trick I do if I'm feeling stressed on a race course). It really was now or never, so I pressed on. I do remember feeling some frustration in those final miles, frustration that it had come down to the wire and I wouldn't know if I'd make the PR until I crossed the finish line. My watch kept showing me I was keeping it steady, right around a 9-minute pace. The 11-mile marker came and went, and so did the 12-mile marker. Still a 9-minute pace...but, alas, it wouldn't be enough to get me that PR. I was really hoping for 1:55, but that certainly was not in the cards. I couldn't read the actual seconds on my watch very clearly, so it could have read 1:53:01 or 1:53:59 and I wouldn't have known the difference. I ran that final mile as best I could. 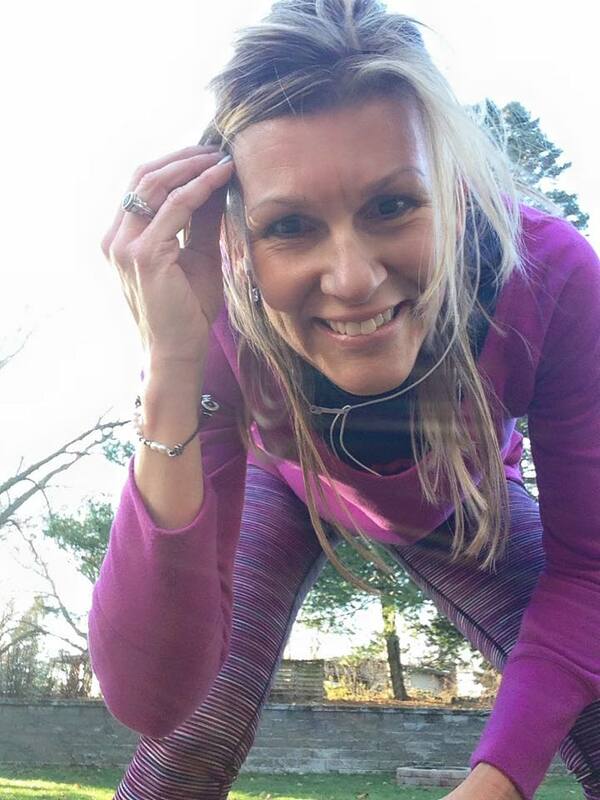 I actually did feel that "final mile kick," and it felt great to just keep going through the motions without much extra effort. I made it up the incline (that we'd run down, in that first mile), and around the final curve and saw the finish line. I also saw Barb and Linda cheering and waving at me. I heard the guy announce my name...and just like that it was over. I glanced at my watch...2:01:44. Damn. No 13.1 PR. No course PR. And no sub-2. Was I disappointed? Sure. But only for a couple minutes. Yes, the PR eluded me again. As much as I am craving another 13.1 PR, I have to acknowledge all of my PR's were achieved at a time when I wasn't rallying back from injury or recovery. I have had some frustrating runs in 2015 (most of them, actually). Recently, though, I have finally felt myself running better and stronger. 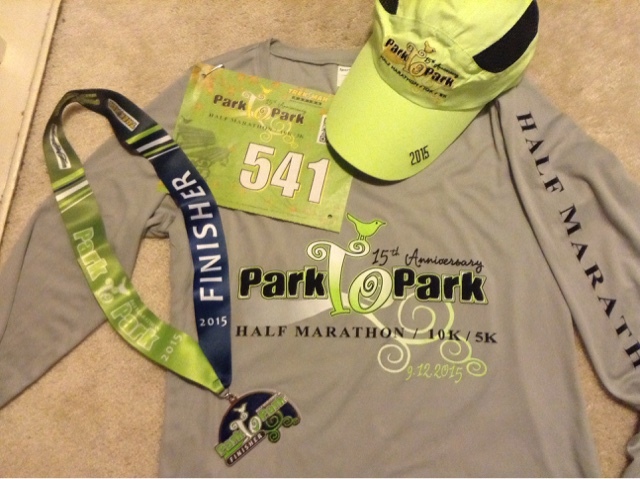 The Park to Park Half Marathon, easily, was my best run in a very long time. I felt strong and fast (for me) the entire race. The usual aches and pains were very minimal (except for that wasp sting), and I never had any fleeting moments of wanting to walk or catch my breath. This was the first race (since I can't remember when) that I have actually felt just as good (if not better) at the finish line than I did at the start. And that's something to celebrate. As soon as I got my finisher medal, I found Barb and Linda and told them I needed to head to the first-aid tent to have someone check my ankle. 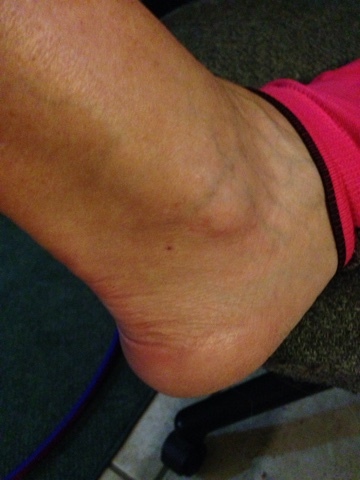 Although I didn't feel like I had any reaction to the sting, my ankle hurt like crazy for the rest of the race. The gal looked the sting site over and didn't see any remaining stinger, and sprayed my ankle (probably an antiseptic spray?). She also told me there had been several other runners who had gotten stung (Barb was one of them), all of them at mile five as well. So, my stats? 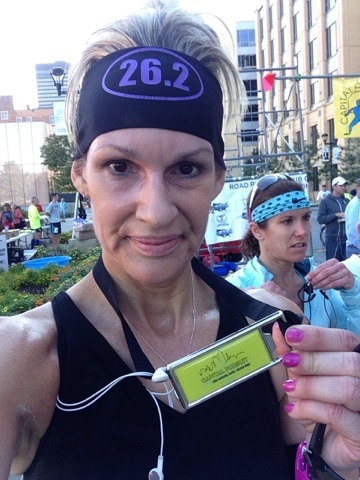 I finished 349th overall (out of the 770 half marathoners), 160th out of 496 females. I also came in 11th place out of the 41 gals in my age group...and placed 43rd out of 169 gals in the Masters Division (yes, I am that old). Not too shabby. Despite the missed PR, I still thoroughly loved everything about this race. As I said, this was my fifth consecutive year running this half marathon (here's the recaps from 2013 and 2014), and I will probably keep returning to this event as long I'm able. The organizers do a great, professional job in putting on a first-class event. The pre-race communication is thorough. The race course is absolutely beautiful! The water stations are fully manned with volunteers. The post-race party is out of this world. The race shirts are colorful with great graphics. 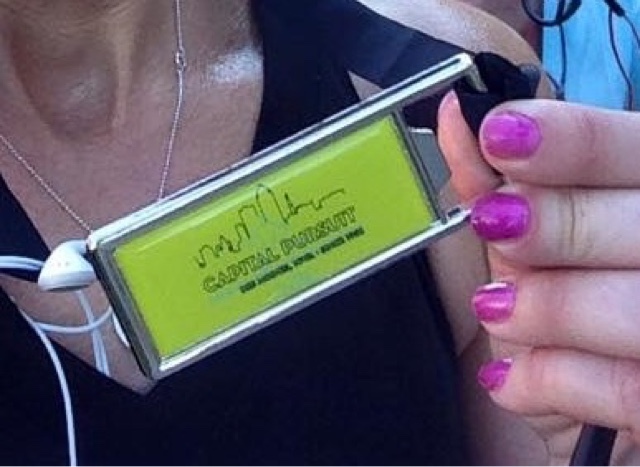 And the finishers medals are to die for! 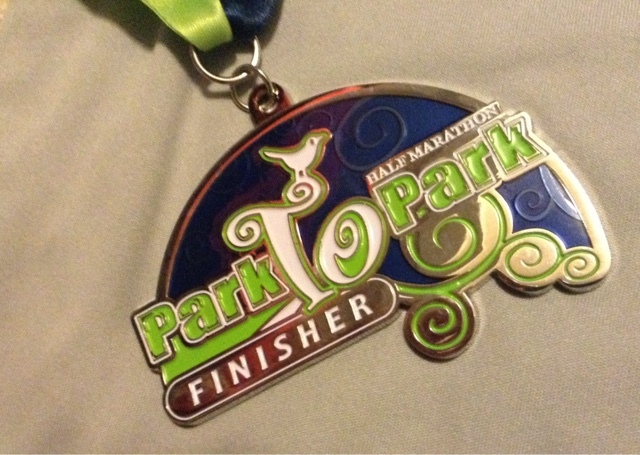 My fifth Park to Park medal...isn't it pretty? 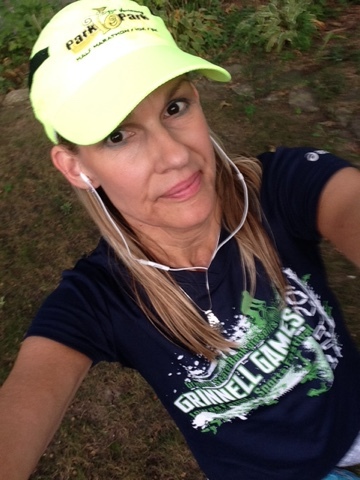 Another neat aspect of this year's event is that I won a 2015 event hat from a pre-race contest! I'm typically not a hat-wearer, but this hat rocks!!! Upon finishing the race, we spent a short while eating a quick snack (and guzzling chocolate milk) before heading back to the hotel for a faster-than-fast shower and clean-up. 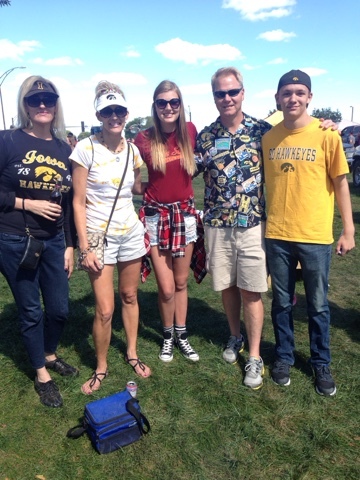 I live in Iowa, and the husband and myself are both University of Iowa Hawkeye grads.....and it was game day. Our big inner state rivals are the Iowa State Cyclones, and we had a football game to get to with two of our kids and my sister. Eighty minutes in the car, a quick foam roll session at home, and I was back in another car headed to the game. 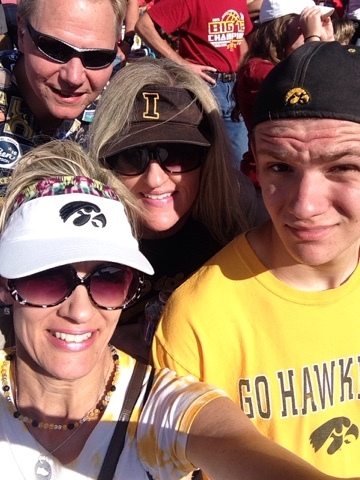 Lots of standing, sunshine, time with family and a Hawkeye victory! All was great! 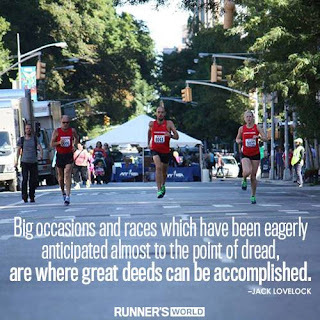 Have you ever ran what felt like a great race, only to have a finish time wasn't quite as fast as it felt? Ever head off to a sporting event (almost) immediately after finishing a race? Anyone other Hawkeye fans out there? Ever experienced envy as a runner? There are different kinds of envy in the world of running, and I have experienced every one of them. We've all felt speed-envy. 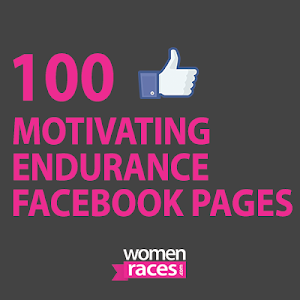 A lot of newbies experience endurance-envy, and/or distance-envy. Most of us know what shoe-envy feels like. Currently, I've been bitten (most aggressively) by Big-Event-on-the-Calendar-envy. Did you know such a thing exists? Well, it does in my world. This is the first, in several years, that I do not have a major event on my fall calendar. Don't get me wrong, I have several great events on the roster, but none of them require the physical (and mental) toughness (or training) like I've needed in years past. 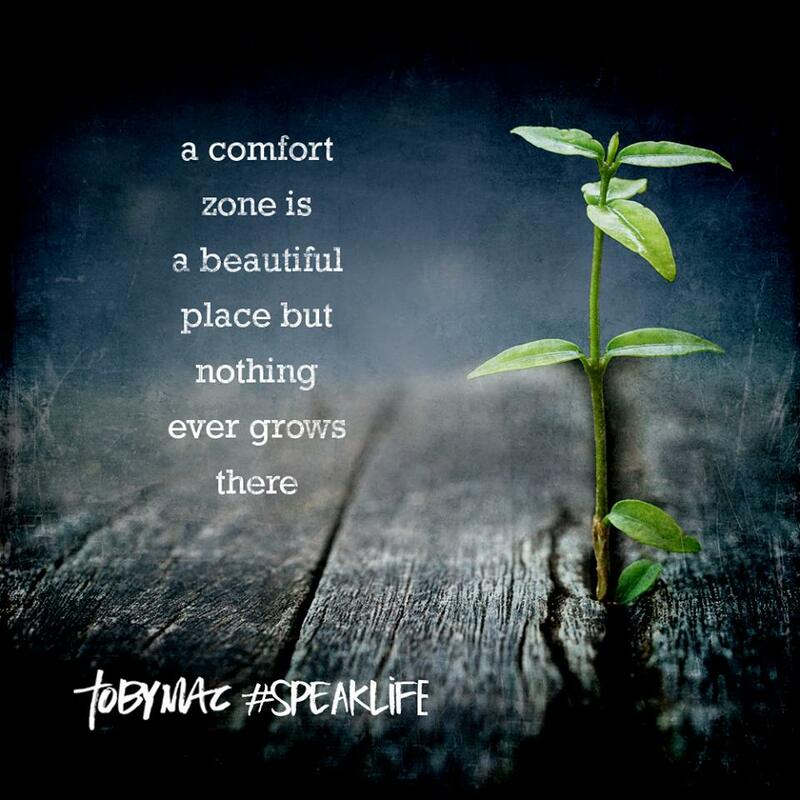 It's definitely not a bad thing, but it does have me feeling a little displaced from my comfort zone. 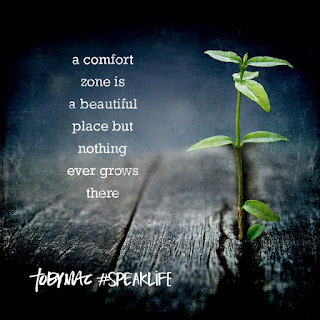 Usually, I strive towards getting out of my comfort zone...but in this case, not so much. I have been running for over 10 years, and I have been doing distance training for the past seven years. The first few years went pretty smooth with moderate gains (in speed and distance) and minimal injuries. In recent years, though, as all of the miles (in training and racing) have increased, there have been more injuries and plenty of aches and pains. It has taken me awhile (with numerous setbacks accompanied by physical therapy), but I have finally learned to respect not only the required training, but also the necessary rest and recovery following the events that caused said injuries. So, what has happened to get me in this "envy funk?" Nothing bad. Plain and simple, I am happy with all that I have accomplished thus far in 2015, but have chosen to go easy on myself and give my body a proper recovery from the events of the summer (a marathon in June, an ultra in July, and a duathlon in August). Many of my runner friends, though, are doing fall marathons, and the temptation is overwhelming to do one also. I hear about all of their double-digit training runs, and see their sweaty selfies...and I cannot deny the envy is clear and present. 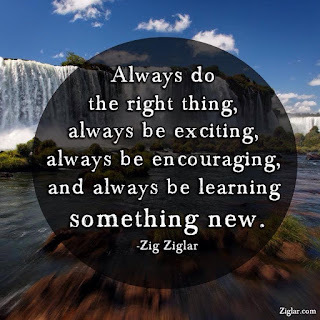 My training was a little out of whack in preparing for my summer events (due to the demands of all my spring happenings and obligations), so I'm a little envious for a decent (and consistent) training schedule as well. Such is life. Ever the opportunist, I am trying a different approach to my fall races this year..... (cue the drum roll) I'm actually going to try "racing" them instead of merely treating them as training runs. That's right. Since I don't have a big event looming over me (to save my "all-out efforts" for), I'll be shooting for some PR's. I'm not hoping to knock off a huge deficit in finish times, but I am going to try to focus more on my pace and splits than I have done in recent years. Truthfully, that is a little scary for me. I'm not afraid of running 13.1 miles, but it's a different ball game for me to try to run it faster than what I have grown accustomed. 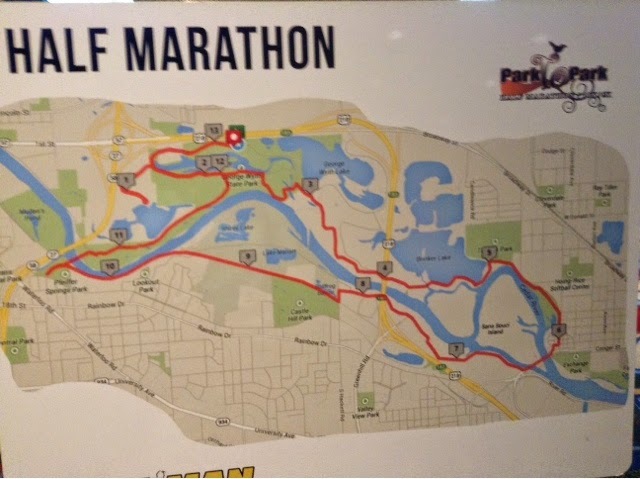 I have the Park to Park Half Marathon (Waterloo, IA) coming up this weekend, and my next half marathon is the Des Moines Half Marathon, which is five weeks later (October 18th). That's plenty of recovery time in between the two 13.1's. Also nestled in among the two half marathons is the Quad Cities Marathon (Sept. 27th), and for the first time ever, I'm running on a marathon relay team (my leg is just under seven miles). It will be strange to not be running the full marathon (like I did in 2013) all on my own, but I am looking forward to this new adventure in sharing the 26.2 miles with a team. After all, it doesn't always have to be about me. This weekend's long run reinforced the value in a "conservative" fall schedule for me this year. I had a couple of really good (moderately speedy!) runs this past week in the sweltering heat and humidity, so I was confidant my long run on Saturday would go just as smooth. 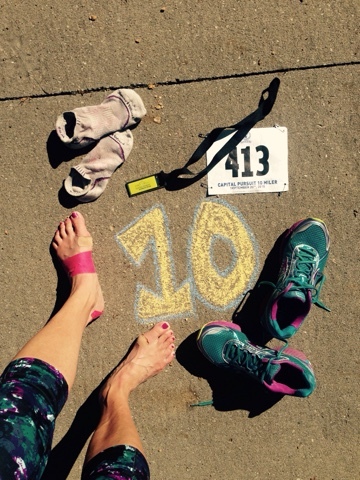 My friend, Barb, and I ran 10 miles, and it was anything but easy. We got a pretty early start (6:45AM), so the temps weren't too bad (though the humidity was already high). Most of those 10 miles felt like a constant struggle for myself. Although the typical aches and pains were minimal (and gone after the first couple miles), my energy level was non-existent. I didn't have water along with me (though we stopped at a couple drinking fountains), and I hadn't slept very well the night before. Add in the humid air, and I had a whole mess of challenging circumstances. These difficult training runs happen to all of us now and then. 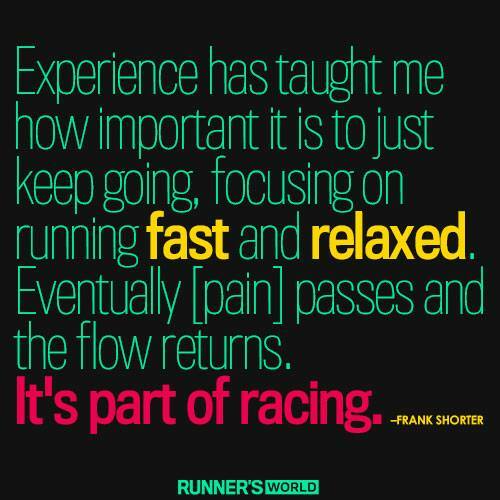 They're not fun to endure, but they do make us stronger. 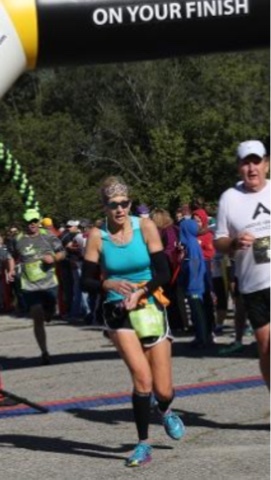 Even though I have run 10 miles many times before, the thought of going any further (as needed for 26.2 training) seemed especially crazy (and nearly impossible!) to me on Saturday morning. Thankfully, I will not have to worry about running any farther than 13.1 miles for awhile. I expect to have a few (actually several?) fleeting thoughts of switching my registration to the full marathon in October, but I will fight them. I know I could grit it out and do a full marathon, but it would not be pretty (or a wise decision for my "in recovery" state of being). 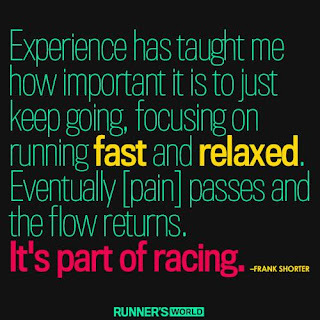 I know my body needs this recovery time, and I have already seen some significant improvements (in speed and diminishing aches/pains) due to the conservative mileage I've been logging...I am going to just keep moving forward and trust what my gut instinct is telling me. Most of us are blessed with a gut instinct, after all, it's best to respect it. Right? Have you ever found your self in a bit of a slump while on sabbatical from intense training? What did you do to control any event-envy you may have experienced?